How can I serve you today? Valid at participating locations. One order per coupon. Breakfast served 24 hours. Not valid with any other offer. With Valpak® coupon only. Coupon void if altered. Expires 05/05/2019. Double with melted American cheese, lettuce and thousand Island dressing. Includes fries, soup or hashbrowns. Valid at participating locations. One order per coupon. Breakfast served 24 hours. With Valpak® coupon only. Coupon void if altered. Expires 05/05/2019. EYE-OPENER BREAKFAST $5.99 at George Webbs Two eggs & your choice of bacon, ham, or sausage (patties or links) & toast. Valid at participating locations. One order per coupon. Breakfast served 24 hours. With Valpak® coupon only. Coupon void if altered. Expires 05/05/2019. 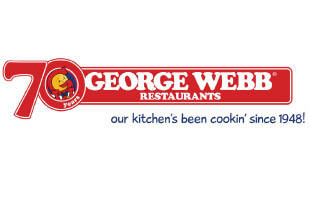 George Webb Restaurants of Southeast Wisconsin has homemade foods that taste like you cooked them in your own kitchen. Ask your friends and neighbors and it’s likely they’ll mention George Webbs serving all of Southeast Wisconsin, Milwaukee, Waukesha and surrounding areas. We make your breakfast, lunch or dinner experience one you’ll come back to again and again. We have burger platters, chicken tenders, shrimp entrees, fried fish and value combos, along with our traditional breakfast egg dishes like skillet & scrambler omelets and more. Or, stop in late for a hot pot of coffee and a delicious dessert. Print our online Valpak coupons to save on our foods. Farm Fresh Eggs, Griddle Greats - Wheatcakes, Omelets, Breakfast Skillets & Scramblers, A La Carte, Sandwich Value Combos, Dinner Platters, Appetizers, Fresh Salads, Sides, Desserts, Beverages. Any Breakfast, Anytime!, Webb's Premium Burgers, Burgers-In-A- Bag-To-Go, Classic Burgers, Mrs. Webb's Soup & Chili. George Webb Restaurants Locations: Brookfield, Cedarburg, Franklin, Germantown, Greenfield, Hales Corners, Hartford, Milwaukee, New Berlin, Oconomowoc, Peshtigo, Port Washington, Racine, Waukesha, Wauwatosa, West Allis and West Bend.